After taken an imperfect super soldier serum, Schmidt turned into a hideous creature: he has red-burned skin all over his body. 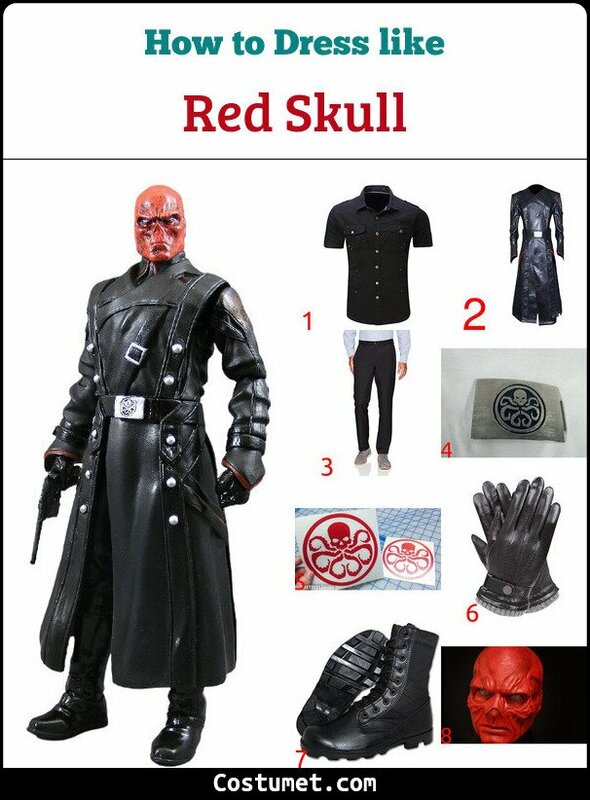 Red Skull wears a black leather trench coat with the Hydra sign on it, a belt with the Hydra buckle, black pants, black gloves, black leather boot. He should also carries a Tesseract as a prop. Does this look seem cool to you? Check out our item list down below to recreate it right now! 1 Black Military Styled Shirt Wear a plain black buttoned-down shirt in military style. 2 Black Leather Trench Coat Top a trench coat over your shirt. 3 Black Pants Pair up your top with a simple pair of black pants. 4 Hydra Belt Buckle Get the Hydra belt buckle and attach it to a black leather belt. Wear it over your trench coat. 5 Hydra Sticker Get a red Hydra sticker and put it on your trench coat's sleeve. 6 Black Gloves Wear a pair of plain black gloves. 7 Black Combat Boots Match your outfit with black combat boots. 8 Red Skull Mask Wear the Red Skull mask to recreate the burnt effect. 9 Tesseract Prop Carry a Tesseract as a prop! Red Skull or Johann Schmidt, played by Hugo Weaving , is the main antagonist in Captain America: The First Avenger, the first Captain America movie that hit theater in 2011. Johann Schmidt is the former head of HYDRA-Abteilung, a secretive weapon division of Nazi. Driven with his greed of power, Schmidt creates and tests the flawed Super Soldier Serum on himself which transforms him into the demon-like creature and earns the named Red Skull. During the chaos of the World War II, Red Skull gains his possession over a Tesseract and tries to get the power out of it. However, Captain America gets between his plan. During the fight, Red Skull touches a Tesseract and vanishes leaving Captain America to dive with the plane into the glacier.